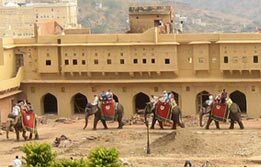 Rajasthan Forts and Palaces tour is an ultimate reason to visit this royally magnificent state of India. 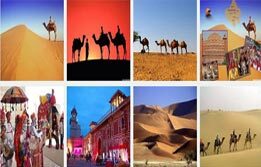 Lasting for 21 days, this enchanting journey uncovers almost every attraction here including forts, palaces, havelis, temples with a vibrant and colourful element of royal Rajasthan. 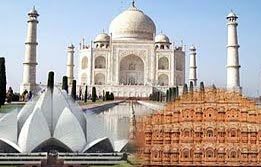 Upon arrival in Delhi, meet India Budget tour representative for assisted transfer to hotel for overnight stay. After breakfast, dedicate a full day towards the heritage of Delhi based on old and new character. Visit Red Fort, Jama Masjid, Raj Ghat (Cremation site of Mahatma Gandhi), Qutub Minar and India Gate (War Memorial). This will be followed by another unique experience of driving past the President House & Parliament House. Overnight stay in Delhi. After breakfast, drive to Mathura, the birthplace of Lord Krishna (203 km / 4 hrs drive). Enroute visit the Mathura temples. This city is closely associated with the life of Lord Krishna, whose birth; childhood and adulthood are richly woven into the poetry, music and dance that are part of Indian tradition and culture. Rajasthan culture and traditions are also fondly associated with Lord Krishna. Who can forget Mirabai and her selfless devotion toward her Lord? Later, continue towards Agra. 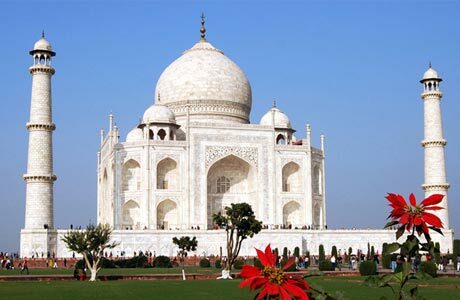 Upon arrival, transfer to the hotel for overnight stay in Agra. 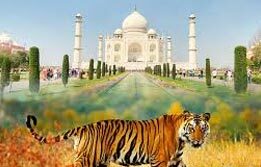 After breakfast city tour of Agra visiting the world famous Taj Mahal, Agra Fort and Itmad-ud-Daulah. 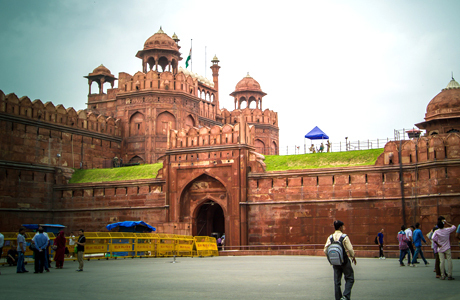 This resplendent Mughal city is a home to several Mughal monuments that have seen the history in the making. Overnight in Agra. After breakfast, drive to Jaipur (232 km / 05 hrs). En route visit another Mughal remnant on the route to royalty. This is the Mughal city of Fatehpur Sikri still in excellent state of preservation. Continue towards Jaipur. Upon arrival, transfer to the hotel. 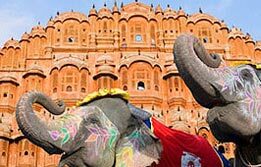 In the noon, begin the city tour of Jaipur visiting the Hawa Mahal, the palace of winds, the Observatory or the Jantar Mantar. Overnight stay in the hotel. After breakfast, drive to Pushkar (145 km / 3 hrs ). Enroute visit Ajmer Sharif. Upon arrival, transfer to the hotel. This is famous for a dargah that attracts pilgrims from world over. 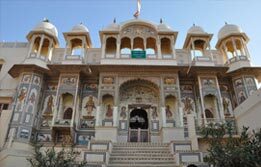 Later visit Pushkar, famous for its picturesque sites as well as more than 400 temples. The most important of the temples is the Brahma Temple (only temple of Lord Brahma, the creator, in the world). 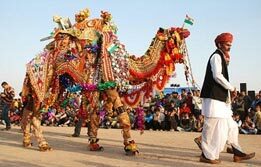 Also, the town is famous for the annual Camel Festival of Rajasthan. Overnight in Ajmer. Morning drive to Ranthambore (255 km / 05 hrs). 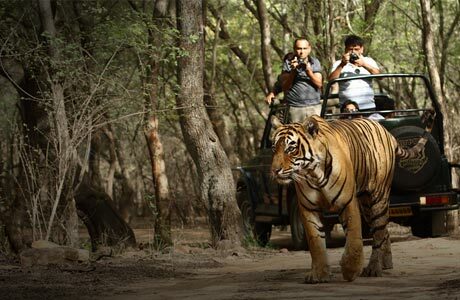 Upon arrival, transfer to the wildlife resort. 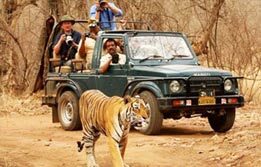 Enjoy the evening game viewing trips in open jeeps to Ranthambore national park and spend time tracking tigers and viewing other wildlife attractions of the park. Overnight at the resort. After breakfast sightseeing of Kota visiting Man Singh Palace museum, Chambal Garden, Haveli of Devtaji, Jag Mandir. 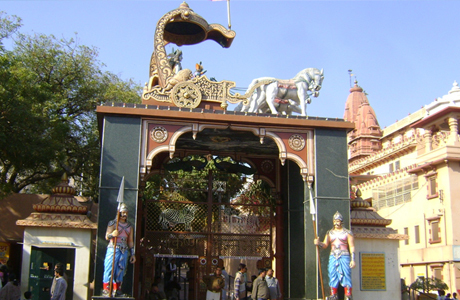 The other places worth visiting in Kota are Kansua temple with a four faced Shiva Lingam, Bhitria Kund, Adhar Shila, Budh Singh Bafna haveli and Yatayat Park. Later drive to Chittaurgarh (172 km / 02 hrs drive). the famous warrior, Maharana Pratap belonged to Chittaurgah. Enroute visit 11 century Menal and Bijolia temples. Upon arrival, transfer to the hotel in Chittaurgarh. Rest of the day is free for leisure. Overnight in Chittaurgarh. After breakfast, visit the fort, Vijay Stambh (Victory Tower), Kirti Stambh (Tower of Fame), Rana Kumbha Palace etc. Later drive to Udaipur (115 km / 03 hrs). Upon arrival, transfer to the hotel. Rest of the day is free for leisure. Overnight in Udaipur. 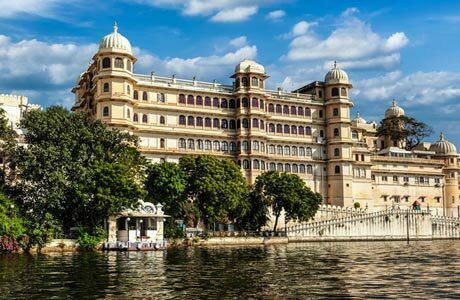 After breakfast, begin a city tour visiting City Palace, Jagdish Temple, drive around Fateh Sagar Lake, Sahelion ki bari (Queen's resort for her friends) and Bhartiya Lok Kala Mandir (Folk art museum). Evening visit Eklingji and Nagda temples. Overnight in Udaipur. Morning after breakfast, check out Udaipur for a drive to Kumbhalgarh (100 km / 02 hrs). Afternoon proceed for a sightseeing tour of the famous fort. Overnight stay at hotel. After breakfast drive to Jodhpur (159 km / 3 hrs). Upon arrival, transfer to the hotel. 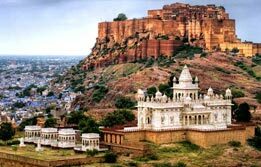 Later visit to the Mehrangarh Fort, Umaid Bhawan Palace, Mahamandir Temple, Jaswant Thada, Clock Tower Mandore Garden. Overnight stay in the hotel. After breakfast, sightseeing tour of Jaisalmer, which includes a visit to the 12-15th century Jain temples, Folk Museum, Gadi-sar Tank & the colorfully painted homes known as Havelies. Afternoon we drive to Khuri Village. 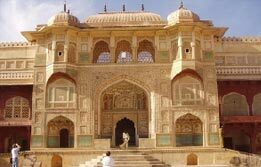 Khuri is a village 45 km south west of Jaisalmer. It is a delightfully peaceful place with mud and straw decorated houses. Further proceed for 1 Km away from village; you can see magnificent patches of sand dunes. You can have camel ride here. People & village life can be seen on the way to Khuri in various villages. Drive back to hotel for overnight stay. Or you may stay in a tented camp there only. Morning drive to Khimsar (335 km / 7 ½ hrs ). Upon arrival, transfer to Hotel. Rest of the day is free for leisure. Overnight in Khimsar. 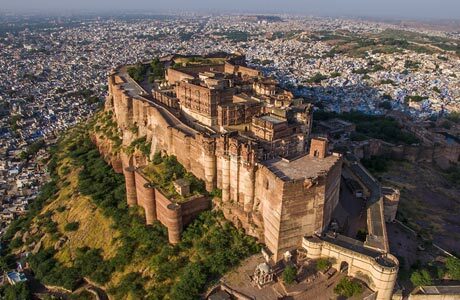 After breakfast, begin sightseeing tour of Bikaner including visit to the historic Junagarh Fort, Bikaner Palace and the Golden Jubilee Museum. Later drive to Mandawa (165 km / 4 hrs ). Upon arrival, transfer to the hotel for overnight stay. 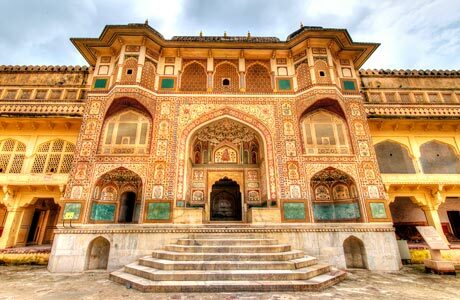 Morning devote a sightseeing of this Shekhawati region famous for its havelies and gorts. 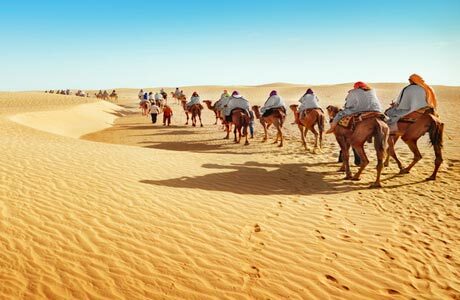 Evening enjoy the picturesque view of the desert state. Later drive to Delhi (260 km / 5 hrs) drive. Upon arrival, transfer to the hotel for overnight stay.